Dale Earnhardt Jr., Elliott Sadler and Kyle Larson are this week’s guests for the Life of Dad Show Remix. This episode of The Life of Dad Show Remix takes a look at three dads who made a name for themselves in the world of NASCAR. We talk with Dale Earnhardt Jr., Elliott Sadler and Kyle Larson. These interviews were from previous episodes of The Life of Dad Show and highlights their conversations on fatherhood. Leave a review on iTunes or wherever you download the podcast for a chance to win a Life of Dad prize pack! Dale Earnhardt Jr. is an American professional stock car racing driver, champion team owner, businessman, and television analyst for NBC Sports Group. He began his racing career at seventeen years of age with his dad, Dale Earnhardt Sr. He won consecutive NASCAR Busch Series Championships in 1998 and 1999 and the Daytona 500 in 2004 and 2014. Dale lives in North Carolina, with his wife, Amy, and their daughter, Isla Rose. Elliott Sadler has over 19 years of experience in the NASCAR Sprint Cup, Xfinity and Camping World Truck Series, racking up a total of 751 starts, 14 wins and 26 pole awards. Sadler comes from a long line of drivers in his family, including his Uncle Bud Elliott and father Herman Sadler, who competed at short tracks in Virginia. Climbing behind the wheel of his first go-kart at age seven, Sadler captured more than 200 victories before moving onto the heavier stock cars. At the age of 18, Sadler joined the ranks of the NASCAR Weekly Racing Series, and claimed the track championship title at South Boston (Va.) Speedway in 1995. His success served as a stepping-stone to the NASCAR Xfinity Series when he caught the eye of team owner Gary Bechtel. Bechtel tabbed the young driver to pilot his car in a full-season Xfinity Series effort in 1997. Since then Sadler has been competing and making a name for himself in his sport. Sadler and his wife Amanda live in Emporia, Va., with their two children, Wyatt and Austyn. Off the track, Sadler enjoys playing softball, hunting and spending time with his family. At just one week old, Kyle Larson made his first trip to the racetrack. A few short years later, he had already set his sights on making trips not just to, but around the racetrack, and has been driving the circuit ever since. 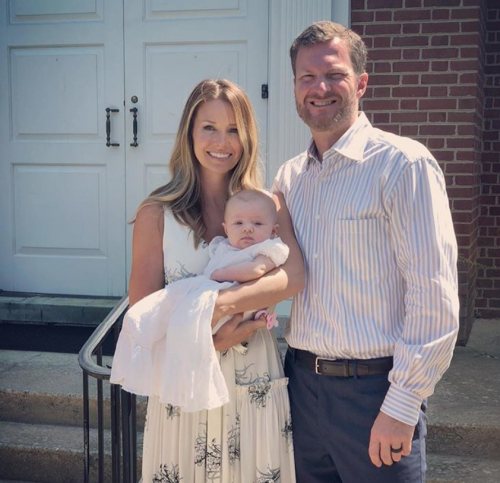 Often among the youngest of his peers to reach a milestone, whether it be his ascent to NASCAR, becoming a dad, owning a home or developing as an entrepreneur, Kyle’s journeys are fast-paced. As a new and young dad, there are many things Kyle wants to share with his son. Kyle and Owen are sure to quickly bond as he teaches him the trades of being a man, like how to change a tire, wire an outlet, or tune his engine. And while Kyle already possesses strong traits that are primed for fatherhood, there are many others he’s working to master before passing along to Owen.